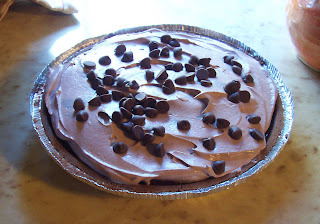 One of my favorite desserts is chocolate cream pie. Quick and easy (especially with store bought crust and instant filling), it is also very satisfying and guilt free. While I usually stick to the standard graham cracker crust, chocolate pudding filling, and cool whip frosting, I decided to kick my latest chocolate cream pie up a few notches. 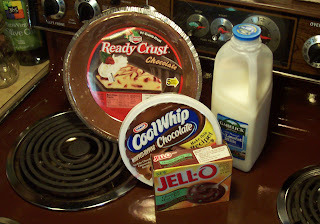 Jell-O has a new mint chocolate chip pudding, so I picked up a packet, along with chocolate graham cracker crust and chocolate cool whip. Why, yes, funny that you ask, I do like chocolate very much! Just a few easy steps stand between your sweet tooth and satisfaction. Following the directions on the instant pudding packet, I whisked the contents with 2 cups of milk for 2 minutes, poured into the pie crust, and let sit for 5 minutes. Last steps were to frost with cool whip (30 seconds) and I decided to also top it off with some chocolate chips. YUM! The last time I made Cool Whip based pies they ended up being thrown at people. This one sounds like it's much better just being eaten. Allie, I like your "set-up picture" a lot. why thank you. i hope no one will be fooled by the presence of a stove in this picture. the pie is strictly no-bake!